Since 2010, the author spent 20,000 hours on his research and collected 1.5M lifestyle and health data to invent five prediction models focusing on preventive medicine. 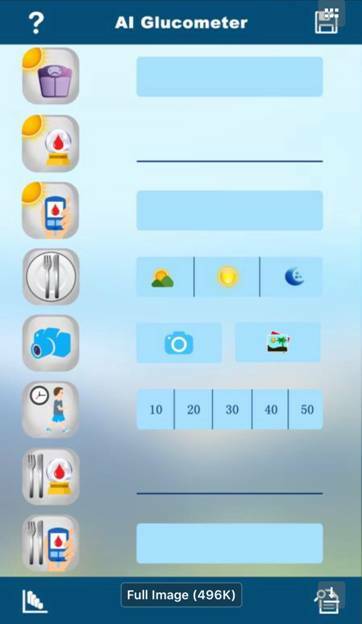 He chose 11 categories with 500 elements to define environment, lifestyle, and health conditions. He then used advanced mathematics and finite element modeling to develop the governing equations of metabolism index (MI) in order to measure a person’s general health status unit (GHSU). 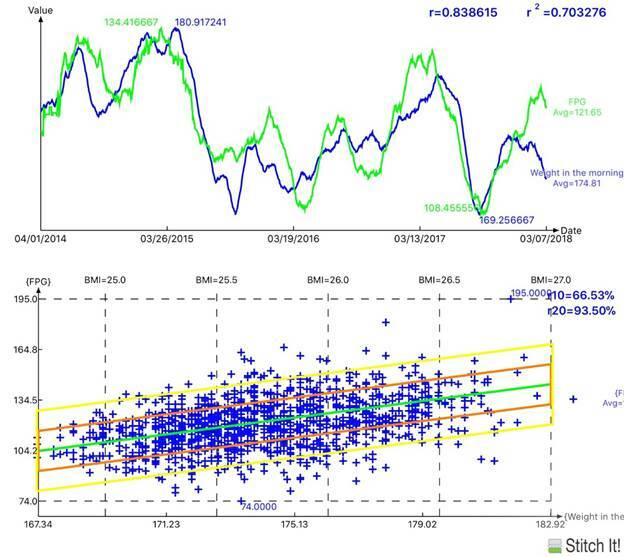 He started with a simple task of predicting tomorrow’s weight output from the previous 3-day inputs. He later developed more complicated glucose prediction models. Although there are five influential factors for fasting plasma glucose (FPG) creation, he discovered that the weight is the predominant one. He also identified 15 sources that create postprandial glucose (PPG) composite waveforms using signal processing techniques. By combining FPG and PPG with the adjusted weighting factors, he can produce an estimated hemoglobin A1C value prior to getting the lab test result. 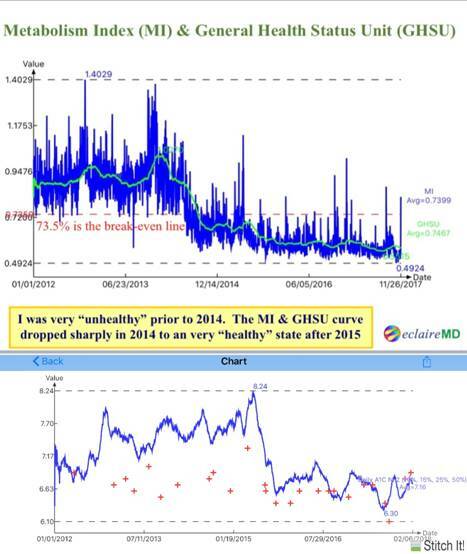 As indicated on the MI & GHSU chart composed of 2,253 days (1/1/2012 – 3/4/2018) with a dividing line at 73.5%, he was unhealthy (~100%) prior to 2014 and became healthy (~60%) after 2014 due to his disciplined lifestyle management and harmonic environment adaption. His weight dropped from 210 lbs. to 172 lbs. and his waistline decreased from 44 in. to 34 in. In addition, his A1C value was greater than10%, while taking three diabetes drugs; however, it is currently 6.5%, without being on any medications. His FPG reduced from 185 mg/dL to 120 mg/dL and PPG declined from 380 mg/dL to 116 mg/dL. His hypertension and hyperlipidemia conditions are no longer health concerns. He utilized optical physics, signal processing, big data analytics, statistics, machine learning, and artificial intelligence (AI) to create prediction models for FPG and PPG and achieved 99.9% linear accuracy with >85% correlation between predicted and measured glucoses. He also developed an easy-to-use AI tool for diabetes patients’ to instantly predict and control their glucose conditions on the iPhone. 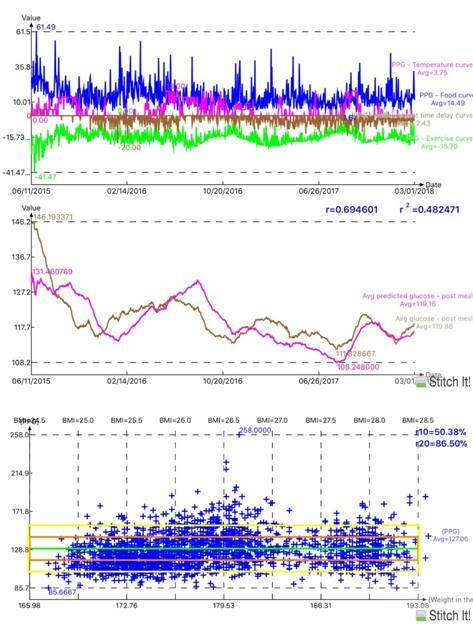 He also investigated body and glucose impact due to detailed food varieties, traveling patterns, water intake, bowel movement, stress and tension, routine life pattern disturbance, psychological effect on physiology, etc. Based on his 8-year research, seven academic disciplines, 35-years of various industry working experience, plus 1.5 million processed data and 3,500 collected meal pictures, the author has not only saved his own life and improved his well-being, but also offered his findings, results, methodologies, and tools to other chronic disease patients for them to understand their environment interactions, lifestyle improvements, and disease control. He firmly believes that prevention is more important and effective than treatment; therefore, if you can predict your disease condition accurately, then you can control them correctly.